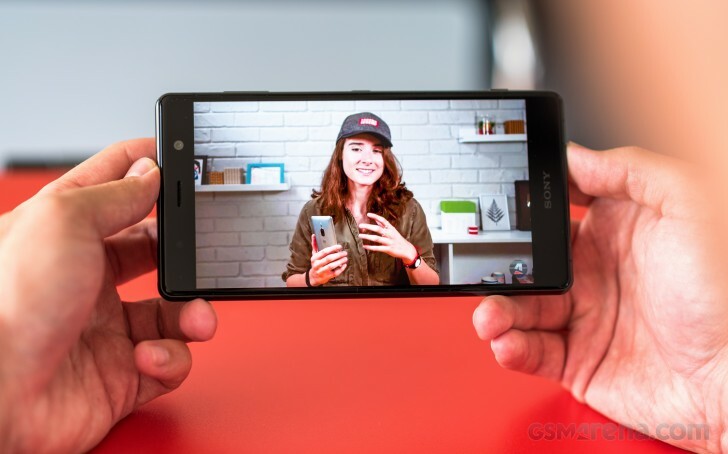 Sony remains the only maker to offer a 4K display on a smartphone three years after they went all out with the Z5 Premium. Unlike the first and second generation phones, both 5.5 inches or thereabout in diagonal, the XZ2 Premium is now larger at 5.8 inches. It's in a classic 16:9 ratio too, no 18-point-something-to-9 nonsense here. The pixel density works out to just 765ppi this year, previous 4K Xperia Premiums were north of 800ppi. We measured a maximum brightness of 518nits on the Xperia XZ2 Premium, some 50nits lower than the XZ Premium before it. The current-gen XZ2 is a full 100nits brighter at 618nits. There's no boost in Adaptive brightness mode. Reasonably well controlled blacks result in a contrast ratio upwards of 1400:1 - decent as LCDs go, but the LG G7 and the HTC U12+ are in the 1800s. Sunlight legibility on the XZ2 Premium isn't great. It matches the previous Premium in contrast under direct light, but that's a pretty low bar, with virtually all competitors being at least a little better, and the likes of the Galaxy S9+ and iPhone X significantly so. The Xperia XZ2 Premium's display settings promise an accurate sRGB reproduction in the Professional mode, but we measured an average DeltaE of 4.1 - decent, but not all that accurate. In fact, it's only marginally better than what we got in the Standard mode, again compared against an sRGB target (average DeltaE of 4.6). Vivid mode was predictably all over the place. No mode truthfully represents AdobeRGB or the P3 color spaces either. You could tweak the RGB sliders and at the expense of peak brightness get more accurate colors. We got spot-on whites with a 230-187-3 setting, which also gave us a better average DeltaE of 3.1. Perhaps, if you have a colorimeter at hand and you're willing to put in the time, you could further optimize the color output. We feel it's not the end user's job to do it. The Xperia XZ2 Premium's battery is rated at 3,540mAh - some 360mAh more than the XZ2's capacity, and 310mAh more than the XZ Premium. The Galaxy S9+, for example, packs almost as much juice (3,500mAh) for a somewhat larger display area, while the Huawei P20 Pro has 4,000mAh at its disposal to light up virtually the same area as the Premium. In our testing, the XZ2 Premium didn't impress with longevity - much like the previous iteration, in fact. We clocked 8 hours of video playback (same as on the XZ Premium) and 9:23h of web browsing over Wi-Fi (about 40 minutes less than the predecessor) - we could call these numbers decent, but far from the best-in-class. The 33+ hours we measured in 3G voice calls are pretty spectacular, though who still talks on their phones? The Galaxy S9+ can last over twice as long as the Premium in video playback and some 2 hours more in web browsing, though the Xperia comfortably outlasts it in voice calls by about 8 hours. The P20 Pro beats these two in web browsing with its 14:30h of reloading web pages, and is right in between with its 13:14h of looping videos. At 21 hours on a 3G voice call, it's nowhere near the Xperia. Factoring in the efficient standby in addition to the above numbers for the Xperia XZ2 Premium, we've calculated an overall Endurance rating of 77 hours. Our endurance rating denotes how long a single battery charge will last you if you use the Sony Xperia XZ2 Premium for an hour each of telephony, web browsing, and video playback daily. We've established this usage pattern so our battery results are comparable across devices in the most common day-to-day tasks. The battery testing procedure is described in detail in case you're interested in the nitty-gritties. You can also check out our complete battery test table, where you can see how all of the smartphones we've tested will compare under your own typical use. The Premium comes with a fast charger in the box, though as fast chargers go, this proved to be an average one. A 30 minute charge from flat resulted in 38% showing in the status bar (same as the 4,000mAh Note9), while a full charge took 2:26h. It does taper off severely towards the end - two hours into it, the indicator read 94%, so the last 6% needed close to half an hour. Sony was among the first makers to adopt a dual speaker setup for its smartphones all the way back in 2014 with the Xperia Z2, while Samsung for example only did it this year with the S9. The XZ2 Premium we have here today has stereo speakers too - one is in the slit where the front glass meets the frame on the bottom of the phone, the other is the earpiece. It's not the loudest of setups, falling into the 'Good' category in our three-prong test routine. The OnePlus 6 and the Pixel 2 XL are quieter, but pretty much every other current competitor pumps out an extra decibel or ten. 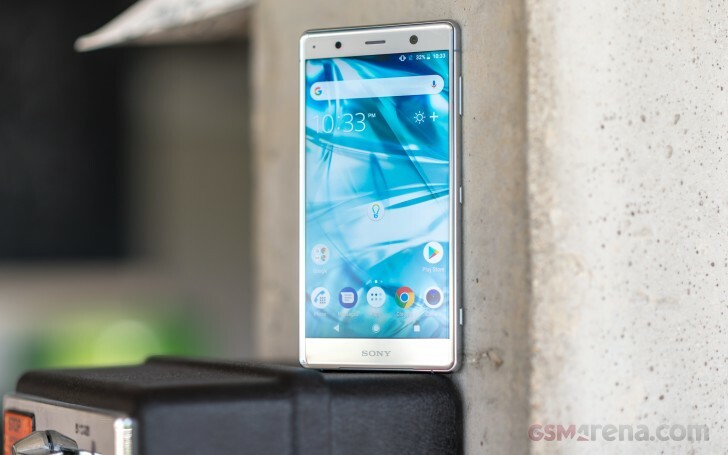 The Sony Xperia XZ2 Premium delivered perfectly accurate output with an active external amplifier, while its performance with headphones was good to very good. Stereo crosstalk rose a moderate amount with our standard set, while the kind of intermodulation distortion that appeared is hard to detect outside a lab. Loudness was a different story, though - the XZ2 Premium was below average without headphones and even worse with them. So if you happen to own high-impedance headphones, you might need to keep that in mind. Otherwise, the phone will probably serve you well.